Galway born actor Owen McDonnell has been working steadily since taking the leap from stage to screen eleven years ago with Irish film ‘Conspiracy of Silence’. A slew of larger roles followed, including the lead in all four series of the highly rated RTÉ show ‘Single-Handed’ and RTÉ drama ‘Wild Decembers’, as well as appearances in BBC’s ‘Silent Witness’, ‘Spooks’ and ‘Mount Pleasant’ on Sky One. 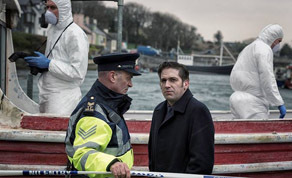 His role in Irish-language thriller ‘An Bronntanas’ sees him take on the complex character of Inspector Fiachra Greene, a morally ambiguous and ambitious detective in Tom Collins’ dark, murky tale that includes a dead woman on a boat, millions of euro worth of drugs and a whole lot of tough decisions to make. Here, Owen McDonnell talks to IFTN about ‘An Bronntanas’, the five part TG4 series that starts on October 23rd. Even from the opening credits of ‘An Bronntanas’, there is a lingering feeling of dread, a promise of violence and an inescapable noir-ish feel. To me, it bears a resemblance to rural dramas like ‘Fargo’ and ‘True Detective’ in that it delivers violence in places violence shouldn’t normally be delivered. Was it this darkness that drew you to ‘An Bronntanas’ or was it something else? It definitely does follow through on the promise of violence! I think it definitely is a kind of Celtic Noir but I also think there’s a lot more humour to ‘An Bronntanas’. They’re not gags per se, but there is quite a lot of humour generated organically by the characters that’s a nice little undercurrent to the dark elements of the show. And I loved that about this production and I think that’s what drew me in. It’s a fantastic landscape, really quite a chilling landscape and people have got a lot to lose so yeah it definitely is quite noir-ish. Right from when I read the script I said ‘Great!’, you know it was a really good script, really ambitious. I felt my character was something I could really play with, really do something I have never done before on television. I felt I could give a very varied performance and have a lot of fun with it too so that drew me in to it also. Tell us about your character, Inspector Fiachra Greene. Well I don’t want to give too much away! My character is a detective who comes in to investigate the murder of the woman in the boat in episode one and he has a lot of history with the area. His father, played by John Finn, is a local cop and there is a clash between the two of them. They have a lot of unresolved issues and they differ a lot on how they view police work. He also has severed a lot of ties more or less with all the main characters. I would say Fiachra is a very ambitious person. He really wants to get ahead and he can be quite ruthless in order to get ahead which leaves him quite morally ambiguous. You mentioned the difficult relationship Fiachra has with his father. In these scenes, the atmosphere is icy and more is unsaid than said. That must have been challenging yet great for an actor to play, especially with someone as accomplished as John Finn? Yeah I mean you can tell a lot about people from how they get on with each other. Myself and John, as people, get on great! We are firm friends! But yeah, you can tell these two characters do not have a good relationship. I think John’s character is keen to make amends. He has done something to wrong Fiachra in the past but Fiachra will not let him in close enough to make amends. There’s a constant uncomfortable feeling between them so we thought we couldn’t have big conversations between these two if they found it hard to communicate with each other so yeah you’re right more is definitely unsaid than said. And there was definitely a lot to play around with in those scenes. You have played a local west of Ireland cop in a popular drama before – as Sergeant Jack Driscoll in RTÉ’s ‘Single Handed’ – was it hard for you to take on what many would perceive on the outset as a similar role? No, I mean it was basically there on the page from the moment I read the script. This is a very different role. Tom (Collins) had cast me based on a short that he saw me in where I played a gang boss so I think he thought there’s a flip side here. Sergeant Jack Driscoll is a very morally driven character striving to do the right thing, Fiachra Greene is definitely less so, more morally ambiguous. So yeah, I’m playing another cop but this is definitely a very different role and it was really nice to play such a varied role. What was it like working with Tom Collins? Great! He’s a great character, very driven, has amazing energy. It’s like inspired chaos sometimes but he always got what he wanted. We had a crazy schedule – I think 15-20 locations over the 8 week shoot but he always seemed to get it to work. He was constantly pushing stuff and he somehow got everything he needed to. But yeah he’s good fun, a good guy. As an actor, I’ll probably be the last person to find out! But I think everyone would love to go for it again. I would anyway, whether that’s possible or not I don’t know. But yeah, I think that was the plan. We wanted to do something that was new to Irish television, certainly new to Irish-language television but perhaps new to Irish television as a whole too. Hopefully it will be a crossover hit because it is partially in English, partially in Polish but mainly in Irish. I think the quality is good and that people who don’t normally watch Irish-language television will switch over to watch so that’s definitely the hope and I don’t see why people who switch over to watch these five episodes wouldn’t switch over again. Besides ‘An Bronntanas’, what other productions will we see you in in the near future? I just finished shooting ‘Klondike’, another TG4 production about the 1897 gold rush. Another fantastic script. That will be a four part series about three Connemara brothers that go over to the Klondike and that again is partially in Irish but also has a lot more English because it features a lot of non-Irish characters. I have a film called ‘Swung’ coming out in January which is a love story set against the backdrop of the Glasgow swinging community which also stars Elena Anaya who is just an amazing Spanish actress.. I haven’t seen that yet but it was another great script so I hope it’s good. I have a couple more things banging around. I have one hopefully for the new year but it hasn’t got the green light yet so I can’t talk about it. But I have just been kind of catching up on sleep lately after my eight weeks of mining, boxing and fighting in the west of Ireland! ’An Bronntanas’ airs Thursdays at 9.30pm from October 23rd on TG4.